Mary Wilson: Showing What The Supremes Are Made Of! 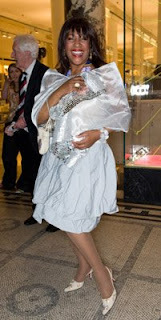 Mary Wilson, was parlaying in London today, while promoting The Story of the Supremes. I think that she looked very chic and GLAM! And will ask do you agree or disagree? Marc Jacobs men's tennis shoes! This Dereon Jean, is BANGING!! Carry your contacts IN STYLE! ART IS FASHION AND FASHION IS ART! William Rast for INDY CAR RACING!! Random Pics of the Gossip Girl and CW Crew! Rihanna in her Elle Cover! SMOKIN' ACES!!! $845 Mens Jeans!!! But they look so GOOD! !